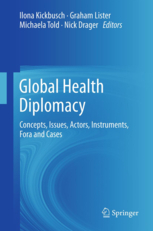 Kickbusch Health Consult advises international organizations, national governments, NGOs and the private sector on new directions and innovations in global health, governance for health and health promotion. Professor Ilona Kickbusch PhD is known throughout the world for her expertise and is a sought after senior adviser and key note speaker. She has a strong commitment to the empowerment of women. She is presently the Director of the Global Health Centre at the Graduate Institute of International and Development Studies in Geneva. She has had a distinguished career with the World Health Organization and Yale University. She has recently been awarded the Cross of the Order of Merit of the Federal Republic of Germany (Bundesverdienstkreuz) in recognition of her invaluable contributions to innovation in governance for global health and global health diplomacy. She works as an independent global health consultant based in Brienz, Switzerland: www.alpenregion.ch. Professor Kickbusch can be contacted at nflnkckbschcm.